The Wall Street Journal published an article yesterday where it described the open-source software movement, whose activists tend to be fringe academics and ponytailed computer geeks. This is one of the many unfortunate stereotypes surrounding open source that I've heard over the years. Let's break some of those down. 1. Open source is a fringe movement. Open source builds mainstream software. I work all day long contributing to open source software, as do many of my colleagues. Why do corporations pay us to contribute to software that doesn't have a price tag? It's in their self-interest to have employees improving the open source software that underlies their commercial offerings. Here are some of the fringe groups involved in Eclipse. These unknown companies are members of the Linux foundation. 2. Open source is not professional. At Eclipse, we ship our software on time every year. We've done that for seven years. That's professional. 3. Open source contributors are loners sitting in their parents' basement working on arcane bugs. Nope. Open source is very social. We interact on IRC and twitter. We attend democamps, learn about new projects and build new businesses. We speak at conferences. The software we work on makes a difference in the world. It helps monitor robots on Mars, manages trains in Switzerland and models chemical reactions. Again, a stereotype that has been proven wrong. 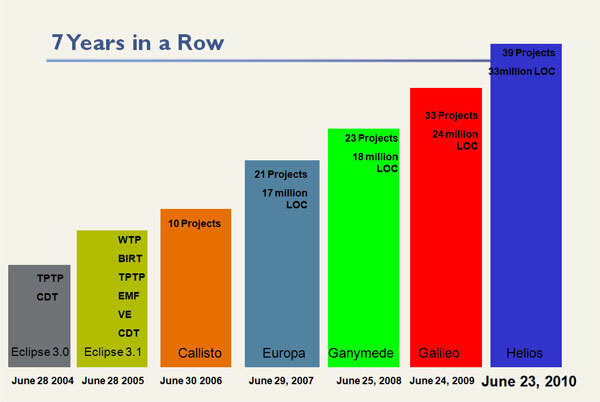 We ran 570K at EclipseCon 2010. Open source contributors run marathons, bike, curl, swim and play soccer or hockey. In fact, you can order an Eclipse bike shirt. We also volunteer at schools and raise money for charity. 5. Open source contributors are always male. We may be a small minority, but here's hoping that these fine female role models will inspire a younger generation of women to consider the amazing career opportunities that open source has to offer. Two generations ago, female doctors were rare. Today, women are over 50% of new Canadian medical school graduates. So, may borrow a phrase from a recent campaign, it will get better. What other open source stereotypes would you like to smash? Thanks. DId I miss something? I clicked the first link originally and it was WSJ homepage. I don't know. It worked for me when I tried. 1. Open source developers work for free in the little spare time they can find from the day job. 2. (Because of #1) Open source software isn't as reliable as you never know how long it's going to be supported. Check out what webserver online.wsj.com uses to serve up the article. According to Netcraft, it's Apache. What? Using software from fringe academics and ponytails for their main shop front? What is WSJ thinking about??? ctrambler: The irony is amazing. Thanks for checking that out! Maybe by "ponytailed' the author meant "women"? In which case hey, credit to him for bashing gender stereotypes! Let's keep in mind this was an op-ed piece from someone writing a book about 'digital democracy' and Internet-based movements and not the voice of the WSJ. See this description at Amazon. Scott, I agree, I understand the context of the article. I just used it as an example because there's a lot of misinformation out there regarding open source communities and the quality of the software they produce.